There’s that moment when you get it – a new cast on, a math concept, what that philosopher really means – the eureka moment. Before that moment, for me, there’s just a mess, in my mind and, when it’s knitting, on my needles, too. It’s taken me years to recognize and appreciate a talent of mine; I make every possible mistake there is to make when learning a new knitting technique. This makes me an extremely valuable member of the Pro-Knitters group I belong to and a very reassuring member of the Knit Night group. The Pro-Knitters are teachers as well as yarn dyers, yarn store owners, tech editors, and knit designers. They try out their new lessons on our group. Everyone is a wonderful knitter so teaching them is easy, they get it, no problem, right away, hardly a question. This is not so great; students will have varying degrees of expertise and will make mistakes. This is where I come in – I make all the mistakes that can be made. It’s actually quite funny. They laugh and shake their heads. I laugh and shake my head. I do eventually get the lesson. Sometimes I’m so delighted that I succeeded that I email a photo of the correct execution to the teacher the next day. I also do that because I’m keen on proving that I’m not a complete dope. I do have some expertise; I did take our Knit Night group through learning to knit a toque – cast on, join in the round without twisting, rib knitting, switch to stockinet, decrease several times, try magic loop, close up those very last stitches. Pom poms I’m no good at. Others made them. That was a relief. We progressed from toques to leaf shaped washcloths with increases and decreases. I was helpful with those I think. 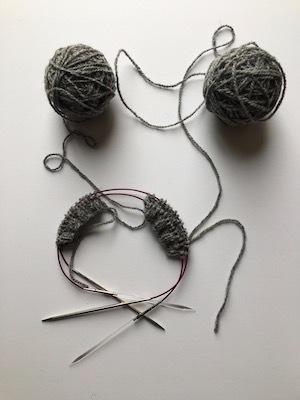 Then the next project, suggested by one of our members, a very good knitter herself, was two socks cuff down at the same time on two circular needles. At this point I bowed out of the teaching and became a student. And there was mess on my needles. I did not get it. I was vocal about not getting it. Other students liked this a lot. The teacher did not get the lesson. Yes! This photo is a mess-free, day-after-lesson test of toddler socks to verify my learning. Isn’t this something we all need to know about other people and to not ever forget? No matter how much someone else knows, they have gaps. No matter how much they know, we know something they don’t know. This is the first sentence I wrote when I started this blog, “It’s said that we don’t really know what we think about things until we write it down.” Not only am I learning what I think, I’m learning too what I know and don’t know. There’s a comfort in that. You are not alone. It often takes me a while to have the eureka moment when trying new knitting techniques. I am so thankful for other knitters who have mastered techniques and then taken the time to share them online, at knit nights or even over email. Most knitters I’ve come across are more than happy to share their knowledge. And kudos to those like you and I who keep trying and keep learning. This is what keeps knitting an enduring craft. But it was gratifying, when I taught my first Intro to Brioche this year, when one of my students, who had already taught herself brioche from YouTube said “it was really worth coming to the class just to learn how to recognize mistakes and all the little hints and tricks you showed us”. Learning the hard way, with all the frustrations it involves, does mean we actually really learn! Great post! I was totally confused after that lesson but after 4 re-do’s and being determined to not give up I have it! (with a few minor imperfections that is). Very rewarding. Thank you for nudging us to try it. 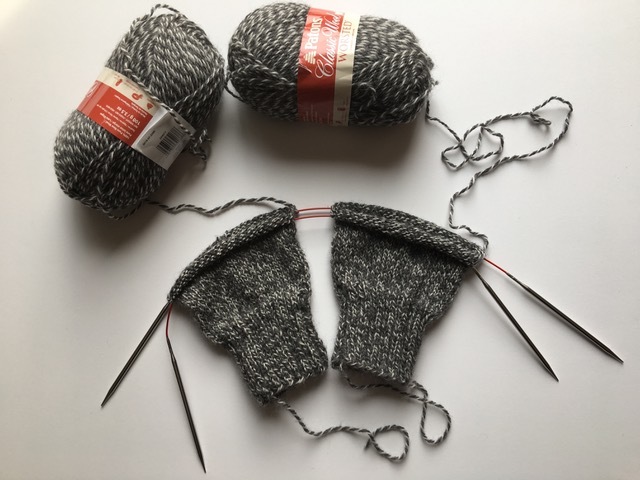 Loved reading your post, and really identify with your experience and appreciate your encouragement – I have not yet knit two socks at the same time, it is time to learn :-) . As Lyn said, learning new techniques can be humbling. It is though well worth any frustration (and tinking!) to get to the Wow!! moment when it begins to make sense. Though I do sometimes go through a lot of tea and dark chocolate to get there ;-). Isn’t knitting the best journey ever?! There is always something new to learn. Your two socks look great. I just bought a book on a new technique so I’m the student there and thoroughly enjoying it. I also love teaching beginner classes. 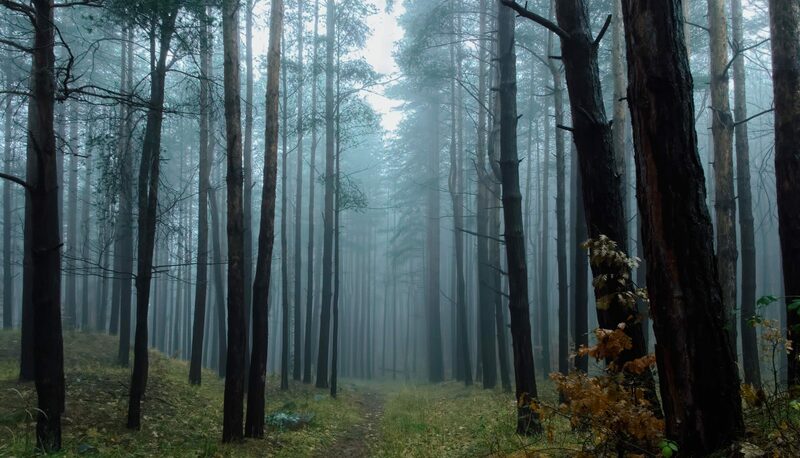 As a teacher, I learn a lot every time because someone comes up with some way of looking at things or not seeing things (much more educational), that I hadn’t run into before. It’s so gratifying when the light comes on. Looking forward to seeing your socks progress. Previous PostPrevious What a Wonderful Weekend!